December – March – Our farm gate store is open Tuesday to Saturdays from 10-4 for nut sales. We are closed Sunday and Mondays during this time. April – November - We are open from 10-5 pm most days and Sundays 12-5 pm. Fresh nuts are available most of the year and potted trees are available July 1 - October 10. Call 905-yeh-nuts (934-6887) or email to confirm we are open for the date you wish to come. We ship to Canada and the USA except for some of the western states. Our customers often live in zones 4 to 7. Our shipping season starts mid-April and ends the week of May 5 for some plants, and May 10 for the rest. For USA orders, the cut-off date is usually the last week of April. We do not ship trees to Europe. No trees are shipped in the fall. For bare root trees: All bare root trees are ordered in advance. These pre-orders can be placed from June until we are ready to ship the next spring. All shipping takes place from early-April to mid-May, but is weather dependant. On bare root tree pre-orders (June-December) we defer payments until January. For pre-orders over $1000 ( late May to March 20), a 25% deposit will be taken with full payment by March 20. For orders placed from January to mid-May payments are taken soon after the order is confirmed by us, and prior to shipping. A 10% restocking fee will be charged on all cancelled tree orders after March 1. For seed sales: Orders are taken from September 1 to October 15r until seed is sold out. Early orders ensure we hand pick the seed you would prefer. We cannot always provide the cultivar seed you want. Our own seed requirements come first. Payment is taken upon ordering. Seed is shipped after payment has been made, when your order is harvested and ready. Shipping of seed takes place after harvest, usually mid-October to mid-November. We will prepare seed for stratification and send instructions for handling the seed. In most cases water will need to be added when received to properly begin stratification. Nut Sales, Nut Crackers, Tools, and Plantra Shelters: Orders can be made year round. Payment will be taken on ordering, and shipping will usually take place on the follwoing business day after payment has been made. Shipping and handling costs vary depending on your shipping address. For most trees shipped to Ontario and Quebec cities we use Canpar, otherwise we use Canada Post. Trees that are shipped to the rest of Canada go by Canada Post. For small orders, under $200, all trees that are longer than 2 feet will need a longer box than the standard 1 m long box. To accommodate the tops, we will need to use an oversize box. Canada post charges us $10 extra for oversize and we need to pass this on. Our shipping costs include packing materials and handling. Minimum Shipping BC AB & Maritimes: $40.00 + $10 if oversize (trees over 2 feet). Minimum Shipping ON: $30.00 + $10 if oversize (trees over 2 feet). Most of these are shipped to Ontario and Quebec locations using Canpar. All other orders are shipped via Canada Post. The packing and shipping rate is fixed at the following amounts per order, but are subject to change if Canada Post raises their rates. *Parcels over 1m add Canada Post fee of $10. *HST & GST apply to shipping charges. Please note that shipping and handling charges may change without notice. Once a superior tree is identified, it can be replicated almost endlessly by asexual means. We call a tree reproduced this way as a “cultivar” or more loosely a “selection” or “variety”. A cultivar can be a tree that is reproduced by grafting, layering, cutting, or tissue culturing. Any tree that is produced by sprouting a seed we call a “seedling” or the child of a tree, and therefore only shares a portion of the characteristics of the female parent. A “cultivar” has almost all of the characteristics of the superior tree. A grafted tree is the only one that is essentially different from the other ways to reproduce trees asexually. A grafted tree uses a root system that is not genetically identical to the tree top. 'Layering' is a method where the plant is produced with its own roots. 'Layering' is an old term used to produce own rooted hazelnut trees. Basal sucker shoots are bent down and pinned to the ground so that the top of the stem is erect. Roots form where the stem is arched upward, making a new plant that is a clone to the suckering mother tree. Since there is almost no difference between trees produced by "layering", "cutting" or "tissue culturing" (all are on their own roots), we will list all of our trees produced these ways as "Layers" no matter which of the three methods were used to produce the trees. What is the difference between a grafted tree and a seedling tree? Seedling trees are grown from seed, so each resulting tree grown from seed is an individual having the seed parent and a pollen parent. They are all different in genetic makeup, just like every child is different. Grafted trees are reproduced by asexual means, that is, the top of a seedling tree is cut off and a small branch section from a superior selection is surgically joined to the seedling tree, resulting in a clone of the superior tree. Grafted clones are given the name assigned to the original selection to identify it as the same cultivar. Be aware that some unscrupulous nurseries use the names of the parent for the seedlings of that tree. In these cases the trees are not clones but children of a selection, or more simply, seedlings. Layering is a method of cloning a selection, but unlike grafting, the tree is on its own roots and not dependent on a rootstock. The term “layering” refers to an old method where suckers or branches from the tree are bent down into the ground, pinned and arched upward so the top of the suckers are up out of the ground. The point where the bend in the ground turns upward is where roots form on the stem. Afterwards the rooted stems are cut off and grown into an identical plant of the parent tree. Cuttings are produced in a similar manner except the branch is removed from the tree and rooted. In our catalog, we simply refer to cutting reproduction as layering too. Most of our fig trees are reproduced by cuttings. I understand stratification is important. How do I stratify my seeds? Yes, it is very important to stratify your seed correctly. Please download the attached stratification instructions for your use. Why don’t you ship potted trees? There are a number of reasons. Packing potted trees for shipping is time consuming and expensive. Our pots are 3-4 gallon size, except for pines, and too heavy to pack. We only ship pines in pots because we have special boxes to secure the small pots. When can I pick up my bare root trees that I ordered? Mid to late April is generally the best planting time, so pick up orders should plan around this. Select a time when your soil conditions are right for planting. Please call or email in advance so we can prepare your trees. Where can I learn more about growing hazelnuts on my farm? We are excited about helping you to learn about growing hazlenuts commercially. We have created a guide to help new growers learn the basics of growing hazelnuts. Click here for the Guide. The first place to begin is the Ontario Hazelnut Asociation, OHA, website where there are many resources available for the beginning hazlenut grower. Click here to go to their website. Also on the OHA website there are OMAFRA Fact Sheets that provide a valuable amount of information. Click here for the Fact Sheets. Ernie wrote a book as a guide for farmers who are new to growing nut trees. It can be purchased through our website OR you can receive it for free when you purchase a 3 year membership to the Society of Ontario Nut Growers. Click here for more info. Once you have had a chance to learn the basics from the information cited above we woule be pleased to speak with you in more detail. How early can I place an order? For orders placed from July 1 to December, we will reply to orders with an email saying the order has been Approved, Then we confirm them by processing the payment in January. For orders placed January to May payment is processed at the time of ordering to reserve the trees. We do take pre-orders for a future year delivery. This can be done by email rather than through the website orderform. I placed an order, but I didn’t hear from you, what should I do? We usually reply to orders that we receive within 48 hours. Please call us or email us because there may have been a glitch in the order process. Do you have a marketplace or garden centre? We have a potted tree area for late spring through fall drop-in customers. It is an informal garden centre and our hours are not always consistent. Summer off-season hours are generally 10-5 daily. If you are coming from a distance, it would be best to call or email a day ahead. We hope to inform our customers about the kinds of trees to plant by identifying the climate zones for which they are appropriate. This alone is not the only important consideration. Most nut trees require the proper pH, soil type, condition and fertility as well as good surface and internal water drainage. It is advisable to check with local nut grower clubs (state or provincial associations) Agriculture agents or garden centers to determine what your conditions are so that we can help you determine what will succeed. For Farmers: Just as you would for other tree crop commercial orchards, it is important to have tile drainage and underground drip irrigation installed before or at planting time. Drainage is important for getting spring run-off drained away and for getting harvest equipment on the land during a wet fall harvest season. Drip irrigation can provide needed water for the trees during drought periods. Trees may not appear stressed but nut filling and quality can be affected making the crop unsaleable. Why can’t you ship to Europe? We do not ship trees or grafting wood to Europe due to the heavy regulations for Europeans to import from North America. We do not do the necessary prior summer inspections. Do I need to buy 2 trees for cross pollination? Most nut trees are bisexual, having both sexes on the same tree. As a result, some nut trees are partially self-pollinating, that is, they shed some pollen at the same time as the female flowers are receptive. However to get complete pollination, a second tree is often needed. Some trees like chestnut and hazelnut will not accept their own pollen and no nuts will result unless there are 2 or more trees. Why do we need early and late pollinators? Walnut trees are usually partially self-pollinating if pollen shedding is at an overlap period when the female flowers are receptive. Receptivity lasts a few days to a week. Some trees shed pollen before the females on the same trees are receptive. Other trees have female flowers that are receptive before the male pollen is shed. By matching the two opposites we get a longer period of pollination and so a bigger potential crop. How close do the trees need to be planted to pollinate each other? They can be planted as close as 2 metres (5-7ft) apart or as far away as 30m (100ft). However trees planted too close in the beginning may not have adequate space as they mature. Also, at the greater distance pollination will be limited by the size of the trees. When the trees are young only a small amount of pollen is produced and less cross pollination will occur until the trees reach maturity and height. I have a small yard. How close can I plant 2 trees? These spacing suggestions vary as some people have limited space while others have plenty. What is the recommended spacing for nut trees to maximize production? Commercial Orchards: All of the trees should be spaced to maximize production. All nut trees except for the smaller trees, namely hazelnuts, should be on a square 40 foot x 40 foot spacing. In the early years, a tree in the centre of the square will double the production. Later these trees can be removed or moved to a new area. Clickhere to see more about this. For landscaping purposes: These spacing suggestions vary as some people have limited space while others have plenty. European hazels and their hybrids will grow to 15 feet tall and spread 12-15 feet. We recommend spacing these trees at 16 feet x 8 feet for early production. In time (10 years or more), alternate trees can be removed to make room for the permanent trees. This can result in a square or a diamond pattern, whichever you choose. 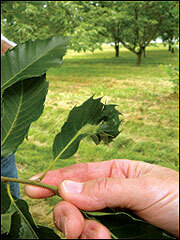 Click here to see more about spacing standard size hazelnut trees. How far apart should I plant my northern hazels? Northern hazels are smaller than their European counterparts. They grow 10-12 feet tall and spread 8-12 feet. As long as your orchard equipment can navigate the lanes in the orchard, I would recommend planting these trees at 14 feet x 7 feet or a tight 12 feet x 6 feet. Click here to see more about northern hazel spacing. Do I need to prune my trees? We do not recommend pruning most trees for the first 2-3 years. Pruning a young tree reduces the ultimate growth for the year and should only be done as a last resort. On the other hand you want to remove undesirable branches before they get over 2 inches in diameter. Pruning is done to open the tree to allow sunlight to reach lower branches and increase nut production. Most home growers do not need to prune more than to remove low branches that interfere with mowing and yard maintenance. Central leader training would be good in the early years. Often young trees will produce 2-4 leader shoots joined at sharp angles. It is a good idea to annually remove all but one of these branches to maintain one upright leader going as high as you can reach with a pole pruner. Hazelnuts will send up suckers from the root and it is advisable to remove these suckers 1-2 times during the growing season. Some growers like to leave 3-4 stems to form the permanent top of the tree. How soon will they produce nuts, or fruit? Grafted chestnut and walnut family trees will often start to bear in 3 years. Seedling trees are more variable and can take up to 6 years to bear. Hazelnut layers or seedlings will start bearing in 2-3 years, while hickory, ginkgo, beech and pecans will take 8-12 or more years even if they are grafted trees. Yes, we provide discounts for tree orders as below. Seed, tools, books and crackers are not discounted. Unfortunately extensive consulting, added paperwork, changes to your original order, and time consuming emails negate or reduce discounts at our discretion. Most nut trees drop the nuts to the ground when they are ripe, so they should be harvested soon after. Hand harvesting and stoop labor can be tiring and discouraging. We recommend the ‘Wizard’, the ‘Little Davey‘and the ‘PushRake’ as tools to gather them. For large plantings where machine harvesting is needed, there are several options and it would be best if you contact us for our suggstions. What is a movement certificate and why do I have to pay extra? The gypsy moth is found over most of eastern North America now, but it has not reached Alberta and BC. As a result, for us to send trees to these provinces, we need to have a CFIA inspection of all of the trees going there with documentation. CFIA charges us for this work and we simply pass the cost on. Why can’t you sell Almond or Alpricot anymore? Almond and apricot (‘alpricot’ is a name we coined to identify apricot cultivars that have sweet seeds) are members of the prunus family that are affected by a European virus called ‘Sharka’ or more commonly known as ‘plum pox’. This disease was found in peach orchards in the Niagara area. To prevent the spread of this virus, the whole region was quarantined. This means that we cannot send trees or seed of these species out of the quarantine area. Why can’t you send hazelnut, pine, quince and chestnut trees to BC? The Canadian Food Inspection Agency (CFIA) regulates the movement of trees. To prevent diseases, including insects, viruses and funguses that exist in the east from reaching BC, this ban is imposed. All payments must be completed before shipping. Payments by cheque must have time to clear before shipping, so we do not accept cheques after March 15 except for pickup orders. Customers may pay by the following methods: cash, US or Canadian personal or business cheque, bank transfer, money order, (for US customers use an international money order), Visa and MasterCard. Please do not send cash in the mail. We require 3 weeks for cheques to clear before we ship. We have a great new website. We are now able to confirm your order online and send you a payment request when payment is due. When you receive this email you can click on the link, or follow the directions to pay online through our secure payment portal. We no longer need to take credit card information by phone. American orders are quoted in US dollars and are to be paid in US funds. This helps to cover the extra cost of inspection, brokerage and shipping across the border. We must pay for these costs in US funds. What is your tree guarantee? We guarantee that your tree(s) will leaf out and grow, provided you follow the planting cautions and instructions provided with the trees. When full price is paid on your tree order there is up to 100% replacement allowance on failed trees provided you let us know in writing by email or mail (by September 1 but not before June 20) that procedures were followed, and the trees were not damaged by insufficient irrigation, a killing frost, insects, a zone we do not recommend or planted a low, poorly drained site. We require a detailed description of the planting site and proof of loss. We may ask for the return of the grafted portion, the entire layered tree or clear photos as proof of loss. All replacements will be provided the following spring and are only replaced at the same value paid which may have included discounts. For Commerical growers most losses are less than 2%. We reserve the right to limit losses. Commercial growers who receive discounted rates for their tree purchase are limited in the refund/replacment policy to a max of 5% of the total trees purchased. A higher rate of loss is not normal and we will work with the grower to find a solution to prevent future losses. Do you sell nuts? When are they ready? All nuts are fall harvested. Our first nuts are available early October from our farm store until sold out. Some nuts and nut meats are available all year round. Mud packing is a term used to describe a way of killing chestnut blight cankers before they encircle the tree. Small branch cankers can be pruned off and burned to prevent spread but when a major limb or the trunk of a susceptible tree is attacked mud packing will control it. Simply make a slurry of garden soil and water, plaster it around, above and below the canker and cover the slurry with stretch wrap to keep it in place. After a month or so it can be removed. If the callous around the injury is normal healing tissue then it was successful, if not, reapply the mud. What is hazelnut bud mite and how do I control it? Hazelnut or sometimes called filbert bud mite is a tiny mite that lives inside the new buds on susceptible hazelnut trees. They migrate from old damaged ‘blasted’ buds to new buds in spring. They remain and feed on the flowers and shoot that eventually would normally grow from that bud in spring. On a heavily infested tree, the buds open and look like they exploded like popcorn. Eventually a shoot will emerge from the area but it will not have flowers and so no nuts. The solution is twofold. One is to plant trees that are resistant to bud mite. However this may not be practical since some of our best selections and pollinators are not very resistant. The second option is to put on one or two sprays at the appropriate time to get control. Since the bud mites live inside the bud it is protected from topical sprays and no systemic sprays are registered. The only option is to spray when the mites are on the move to new buds. The easiest way to determine this is to select several infected trees and place some ‘Tanglefoot’ ™ goo around the branch leading from the blasted buds to the new growth buds. When the bud mites can be seen with a ten power magnifier caught in the Tanglefoot™, it is time to spray. What other names are hazels called? A variety of names have been used to identify hazelnuts. In England they are commonly called ‘cobnuts’. North American native hazels were called hazelnuts and European hazels were called filberts to create a differentiation.Jack Gellatly in BC called his native crosses with European filberts ‘filhazels’ and crosses with Turkish tree hazel as ‘trazels’. Finally Oregon producers decided to call all European, native and the hybrids ‘hazelnuts’, since the other names were often confusing and unknown. We have adopted this simple terminology too. What does open pollinated mean? Trees that are open pollinated are trees that are not produced by controlled pollination. It means that we don’t know who the father is. The pollen source can be any tree in the orchard that is compatible. 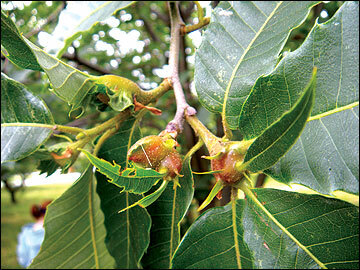 What is the chestnut gall wasp? The chestnut gall wasp (Dryocosmus kuriphilus) was accidentally introduced to Southern USA from Japan on illegally imported grafting wood in 1974. It spread from there northward to Ohio and finally to Southern Ontario. It is a tiny parasite that lays eggs in the chestnut buds in late May and early June, then within 40 days, hatches and remains almost dormant until the following May when the buds become active. The larvae feed on the inside of the bud for 20-30 days causing it to develop swollen distorted growth. It emerges in late May or early June to repeat the cycle. This pest only attacks chestnut. By removing and burning galls in May the spread can be eliminated on young trees. There are no sprays that can be used to control this pest. Fortunately there are parasitoid wasps both natural and imported that follow the wasp and lay eggs in the gall wasp larvae, hopefully keeping it under control and allowing the chestnut to survive. How long do I leave the tree shelter on? The shelters can be left on for several years even after the greenhouse effect is no longer needed. They will protect the trees from rabbits, mice and voles. What nut cracker should I get to crack black walnuts? We like the ‘Duke’ black walnut cracker the best for cracking black walnut. The rack and lever action multiply the force reducingthe effort to crack black walnut. The term ‘Carpathian’ was introduced to identify the Persian walnuts that were brought to North America by Reverend Paul Crath from the Carpathian Mountain region Poland in the 1930’s. The nuts were distributed widely in an effort to expand the areas where the Persian walnut would grow in Canada and the United States. Off-spring of these trees and other sources have been found that have proven hardiness as well. To simplify, we revert back to the more common name “Persian” walnut, the place believed to be the origin of the species. All of my walnuts dropped with black husks. Some are filled with white maggots. How do I control this pest? The insect you are describing is the walnut husk fly, a fly that resembles the common house fly. In black walnuts and heartnuts it does not seriously affect the nut meat, but in Persian walnut shell is blackened and the meat is dark and possibly bitter. The fly lays its eggs in the husk of the walnut in August but it is in the orchard for some time after emerging from the ground. 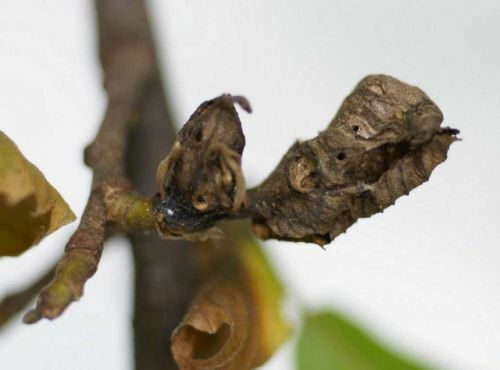 To control this pest, mix an attractant (black strap molasses) with an insecticide that is approved for this pest and spray it on the lower branches of the walnut trees in early to mid-August and again about 10 days later. The molasses will attract the flies to feed on the poison and kill them. In this way the whole tree does not need to be sprayed. The nuts on my heartnut trees are falling prematurely in June and July. What is happening? This could be several conditions or culprits. It could be poor pollination or aborts damaged by late spring frosts. It could be squirrels or grackles eating or knocking them down. Look for bird pecks on the fallen nuts. It could be butternut curculio, a butternut pest that also attacks heartnut. Look for a crescent shaped mark on the surface of the nut, the telltale evidence of the egg laying of this pest. A spring spray can be applied to control this pest but it must be applied before the eggs are laid. We are reducing the use of paper by allowing our customers to print only what they need. Please click here to download a pdf of our 2019 catalog. The printable order form and maps are here.